I've been a bit scale obsessed lately, though not in the way you might imagine. Since deciding to leave California, my stay-or-go anxiety has been replaced with how-to-get-back worries. The hardest part right now is the fact that I don't drive, so renting a minivan or small U-Haul isn't the easiest solution. I briefly considered flying my mother out here to do the driving, but as lovely as it would be to share a cross-country roadtrip with her (to complement the one I took with my father less than a year ago), it's not entirely cost efficient. Flights for her and my kid brother, renting a van, gas, hotels, meals, and then their flights back to Connecticut ... it would eat up about than a third of my savings. Additionally, there are some issues with timing that make it a less-than-stellar option. Hiring a moving company would cost even more, plus the cost of my own flight, and I wouldn't have my things for two weeks - not so much an issue in Chicago, as I'm sure I could find some people who'd let me couchsurf for a little while in exchange for things like cooking and housework. But I'm teaching up until the day before I am planning on leaving my apartment, so I'd be here without anything to sleep on or cook with for a few days. Not ideal. What is, unfortunately, my most viable option, is flying back with two suitcases, and shipping the rest via UPS. When we moved my things out to California, we made cuts to a point where everything I owned fit in the back of my father's pickup truck; at least half of the contents was my book collection (I've decided it's not hoarding, but rather, the manifestation of my childhood fantasy of having a private library to rival the one in "Beauty and the Beast"). Besides that, though, it's just clothes, my computer, kitchen gadgets, and odd miscellany/knick-knacks. With a few more cuts, I could get it down to probably 10 large boxes. With trying to keep each box at 50 pounds or less, I've become very aware of what I own, and what I want to hold on to. Do I really need this magazine and every single receipt from my trip to Paris? How much do I really need all these books? What movies have I not watched in ages that could be let go of? How do I deal with this big painting, the one based on the dream where I came up with the name of my blog? Since I'm in a town much smaller than Chicago, I'm anticipating a much slower turnaround time, so much of the furniture has already been posted to Craigslist. I'm holding off for a bit on the bed, washer/dryer, and TV, but the sofa, loveseat, and desk have already been posted. I already sold the kitchen island stools ... as well as my KitchenAid stand mixer. It was a surprisingly easy decision, as it weighed 22.8 pounds, and since moving, I've only used it to make things I later binged on. There's also a bit of a backstory to how I came to own it, another reason why it was not difficult to part with. Still, it's really interesting to observe the change in my attitude leaving California versus moving here. When I left, I was slightly devastated at losing so many of my possessions - it's not good to be too attached to material things, I know, but they were all the marks of my success. The apartment was my first real non-dorm place to live post-high school, so the bed was the first I bought on my own. The couch was finally mine after sitting on the floor for a few months. I didn't make a ton of money as a grad student, just enough to get by, so being able to put aside a little money and buy things felt amazing. Nothing was fancy, but it was all hard-earned. The things that fill my California apartment are nice, but they weren't earned in the same way. My dad did a great job of getting me set up with all new things to replace what was left in Chicago, but everything was acquired as soon as possible, out of necessity. There's always been a bit of disconnect because of that; I've never felt entirely comfortable in the space. It's never felt like it was my own. The only thing I have the same sort of connection with is my television, which Justin and I bought on a trip to a nearby town after getting my first paycheck. But even that I'm ready to abandon. I had similar attachment issues with losing weight, particularly with my clothes. For a while, I was dropping sizes incredibly fast - I'd get paid on the 15th of the month, and immediately go out and buy a smaller pair of jeans than the month before. It was exciting, but still, I had a mountain of "before" clothes that I couldn't bear to part with. The dress I wore almost every day of my last summer in the 300s ... the hooded sweater I wore all the time (and in dozens of pictures) ... the six or seven versions of the orange shirt in my biggest "before" picture (I had it in every color). They weren't just material, there were memories attached. Even though I could not wear them anymore - and never intend to fit in them again - it was still incredibly difficult to part with it all. Now, though, I'm ready to shake loose and unburden myself of the emotional baggage that's been stunting my progress this year. The interesting thing about maintaining my weight all year is that when I get back to Chicago, I'll be, essentially, in the same place weight-wise as when I left (hopefully a little less, but still not an incredible amount of progress in 10 months). It's like picking up where I left off, only with a year of different experiences and challenges in between. Because of this, I feel okay about making cuts on my possessions. It'll be nice to return to a place where I feel at home, without being as weighed down by so many things. Have you looked into a pod? I know friends have been very happy with them! 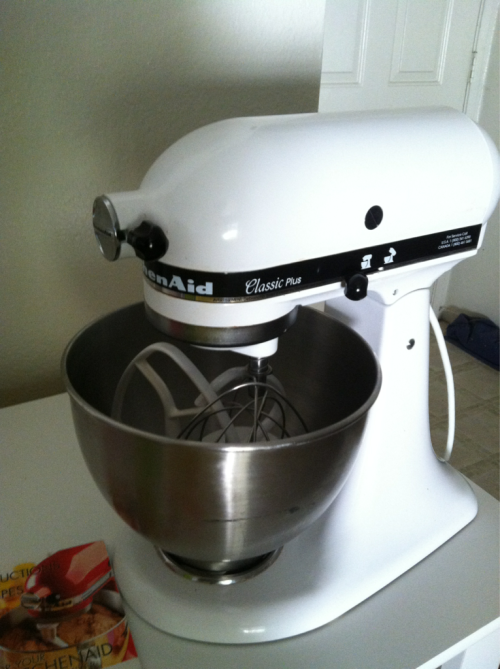 I FINALLY got a Kitchen Aid Stand Mixer after all these years of coveting one- I'd bring it as my carr-on! But I totally understand the great feeling of freedom you get when purging your surroundings of needless crap. I love watching Peter Walsh and shows like Hoarders because it inspires me to get up and clean! I'm glad you're feeling so good about the move! I think it's great that you have such little "stuff". IT sounds like you're on a great track to success and moving back to Chicago is going to be a nice, fresh start. or get a small storage unit until it's convienent to come back and get your stuff. high five on having the same childhood dream! haha. What a poignant commentary about "shedding weight", getting rid of layers and leaving things behind. I've moved a few times and I tend to hold onto stuff because of the memories too - I'm getting better about 'shedding' the weight but it's a process. Congrats on moving forward and enjoy your newest adventure to come! One of my friends moved from IL to FL and what she did was to hirer movers but all of her stuff fit on one pallet. When the company made it's way to her new place in FL is when she got her stuff (she moved in with her mom so she didn't need her stuff per say). Another option might be a POD but i think the pallet option might cost the same as UPS. good luck though! I've always wanted one of those Kitchen Aid standing mixers but couldn't take the financial leap. (Plus no one has room for one of these in a Parisian apartment!) But everytime I'm in an appliance store, I look at them with appreciation. When I moved across the country, I used a local pallet shipping place to ship my stuff. It was expensive, though. Cheap stuff you can reasonably re-buy in Chicago is probably best re-bought. But media mail/book rate with the USPS is quite reasonable, and I never regretted sending my books that way. It's SLOW, so you may worry when you hit, like, three weeks and stuff's just trickling in, but it is cheap. Moving is a liberating experience. I do not keep things in general but somehow still manage to accumulate lots of stuff. It's freeing to be rid of it all, keep what you really want, and drive away. Or fly, in your case. Mary - it sounds like you've really considered all of your options and made the best choice for you. There's something to be said about "starting over fresh" and creating NEW memories with NEW things (because, let's be honest, lots of things carry memories with them) - I am SO EXCITED for you to be back in Chicago (since I'm right up in Minneapolis) and to follow your journey back in the midwest!! This blog totally resonates with me! I am a complete pack rat. Not because I like junk, but because I love memories, I love things that remind me of home (not a place, but a feeling). I love all the little mementos that remind me of good times and the people I love the way they used to be. The way I ended up getting rid of my "fat" clothes was to tell myself that I did not want to be reminded of how I used to be. I gathered them all together and told myself it was time to let go. Even after cleaning out my closet they sat in my corner for weeks before I finally took the initiative to get rid of them. It was a tragic, yet freeing day when I finally took those bags to the Goodwill store. Even now I sometimes look for things in my closet that I have long since cleaned out. And while it makes me sad when I come up empty handed, I'm also reminded of how far I've come and how happy I am to be where I am now. It takes a lot of courage to move forward in life, to leave behind what's comfortable and to pursue your own dream of happiness. Congrats on the decision to return to Chicago! When you get to Chicago, California will be a chapter in your life. One that taught you a lot and those memories won't go away. I find that moving is great because it gives you an opportunity to look at your life and see what you can purge. Sometimes we hold onto things for the reasons that when we later examine we don't understand. Definitely save your before clothes. I have some and I look at them when I need a kick in the right direction. I would compare rates between UPS & USPS. I had to overnight a cell phone charger to my boss and it was going to cost 130.00 via UPS vs. 18.00 via USPS. GOOD LUCK ON BAY TO BREAKERS!!!! good luck on bay to breakers!